Billy Elliot danced back onto the Seoul stage this December with a bold opening performance on Dec. 7 that looks set to inspire Seoul audiences again. The Tony-winning West End hit about an aspiring ballerino from a British mining town had its first non-English speaking production in Korea in 2010, after sweeping North America and Australia. 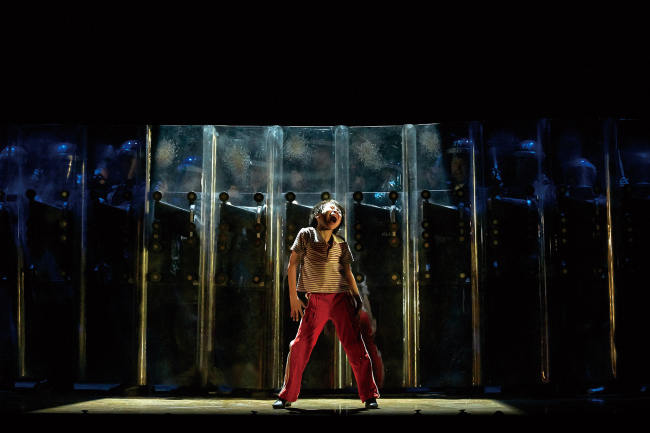 Billy Elliot’s return to Seoul, with an updated translation and a brand-new cast, has been hotly anticipated by local theatergoers for months. Its previous run created a cult-like fandom for the child actors who took up the title role. The audition for the second generation of Korean Billys was nationally televised earlier in the year. The role of Elliot is shared by five youngsters -- Sung Ji-hwan, Chun Woo-jin, Sim Hyun-seo, Eric Taylor and Kim Hyun-jun -- performing on different nights. For last Thursday’s performance, Kim portrayed the odds-beating backstreet boy from 1980s England. The young lead, who storms through the three-hour set singing, pirouetting, tapping and flying on a high wire, provided the essential vitality to Elton John’s music, Lee Hall’s story and Stephen Daldry’s staging. But it was not his showy technique, but his raw emotion and physical willpower that drove the story. Trapped in a mining community engaged in bitter strikes against pit closures, Billy sings when he cannot speak any more, and dances when he can no longer sing. When he demonstrates to his miner father why ballet, not boxing, makes him come alive, his fouette strikes a powerful kinetic statement rather than an elegant flourish. The ballad sung by the dad (Choi Myung-kyung) after he decides to cross the picket line to pay for Billy’s Royal Ballet School audition, speaks directly to the Korean audience, to whom tales of parental sacrifice are not unfamiliar. The local crowd might not be readily conversant with the miners’ strike in Thatcher’s Britain that provides the story’s historical setting, but family devotion, disintegrating communities and struggles of the working-class uniting against police oppression are relevant to Korean society. Against the show’s gritty backdrop, Elliot leaps toward his dream in imaginative breakouts. 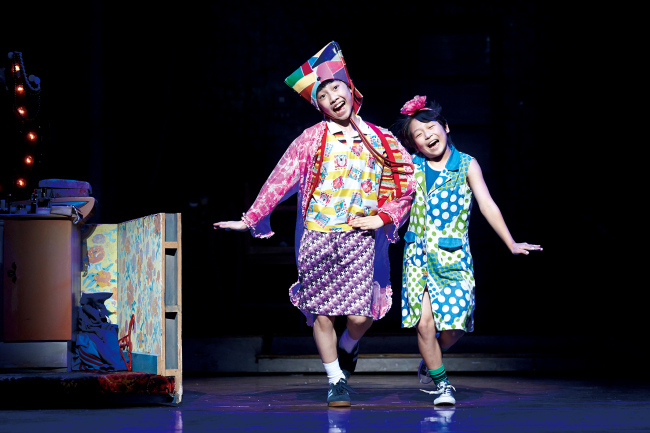 In the uplifting tap number “Expressing Yourself,” Billy revels in women’s clothing with his gay friend Michael (played by Kang Hee-jun). The boys’ joyful dancing has a special resonance on the Seoul stage, where men are discouraged from exposing their feminine sides and other bold acts of self-expression. Yu Ho-yeol, Han Woo-jong and Kwak Ian alternate Michael’s role along with Kang. Kim Ghab-soo, currently on medical leave, will rejoin the cast in February to share the role of Billy’s dad with Choi. Billy’s ballet teacher is played by Kim Young-joo and Choi Jung-won. “Billy Elliot,” will be staged daily (except Mondays) at D-Cube Arts Center in southern Seoul until May 7, 2018. Tickets prices range from 60,000 won to 140,000 won. For more information, visit iseensee.com.